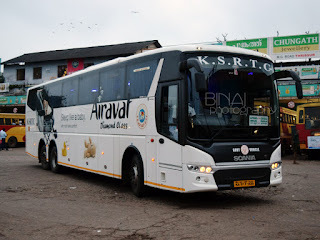 As I completed the examination paperwork, I logged on to the KSRTC website and looked for the next available bus to Bengaluru, and zeroed in on the 1400 departure - this was an Airavat Diamond Class (Scania 13.7M), operating on the Mangalore-Bangalore-Tirupati route. I completed the examination work, and set out to the bus station. I requested the driver to drop me at New Taj Mahal Cafe, since I had to pickup some sweets and other snacks to take back to Bangalore. I got to the bus station by about 1300hrs - the bus was yet to be brought from the depot. The bus was brought in by around 1330hrs - the crew did not take the bus to the platform until about 1340hrs. Meanwhile, I received an SMS confirming the bus number. Boarding commenced a while past 1345hrs - most of the seats were prereserved, while the crew managed to get passengers for the remaining seats. The bus, while being brought in from the depot. The bus pulled out of the bus station at 1402hrs - with more or less all the seats occupied, except those with boarding en route. The driver was a little slow at the beginning. The conductor was busy distributing water bottles to all passengers, and did check if somebody had any other requirements. We had a pickup at Kankanadi (1413hrs) and then at Pumpwell (1416hrs). I was a little too tired, and decided to sleep a little. I woke up briefly as the bus stopped at Upinangadi (1524hrs) for a pickup. I slept for some more time, and I woke up just as the bus started swaying badly as it entered the crumbling ghat section. The Volvo on my inbound had handled the ghats perfectly, but the Scania was throwing me around as it passed through the potholes, er, craters! The undulations on the road was clearly felt inside the bus. The driver kept going slow to minimise the discomfort in the bus though. A couple of passengers requested for a break, and the crew promised to stop at Sakleshpur. We pulled into Sakleshpura bus station at 1723hrs - the crew announced a five minute break, and requested all passengers to return as soon as they could. The crew were a little upset about delays - and they ensure passengers returned to the bus quickly. We started off from Sakleshpura at 1732hrs - a 9 minute break. I had picked up some snacks from the bus station - which helped me satiate my hunger pangs - I had my lunch quite early that day. I dozed off for a while more after Sakleshpur. I woke up just a while before the bus reached Hassan. The bus made a quick visit to Hassan bus station (1829hrs) before continuing the journey towards Bengaluru. It was quite dark outside already, and it was getting a little too boring. Offlate, they avoid playing movies in KSRTC buses - vaguely remember some controversy related to playing movies in buses a while back. Internet connectivity was very patchy, and I was terribly bored sitting in the bus. I watched some movies on my phone to spend time. We pulled in to Hotel Mayura, at Yediyur for dinner (2007hrs) - the bus station was very crowded - in fact, the parking itself was chocked. It was a struggle finding a seat in the restaurant - the service was slow and lousy. The food was fairly good - that was a saving! We started again at 2038hrs - the driver picked up pace after the dinner break - some sense of hurry showed up. I struggled to keep myself awake as we neared Bengaluru. Traffic began piling up as we neared Bengaluru - the toll gate past Nelamangala was chocked. I was finally dropped at Goreguntepalya, outside Vivanta, at 2202hrs - two minutes past the scheduled arrival time at KBS! It was a struggle getting to my home - taxis were unavailable, and buses were scarce! Remarks: The bus, KA57-F-1824, homed at Mangaluru-2 depot had clocked a little over 1.39 Lakh kms. The bus appeared to be quite well kept. 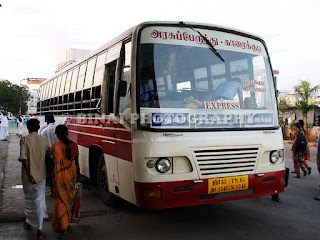 Although it had a FasTag, the bus went through manual gates at all the toll plazas. The crew were well behaved - very soft spoken. Driving was very good - the roads didn't help matters though. 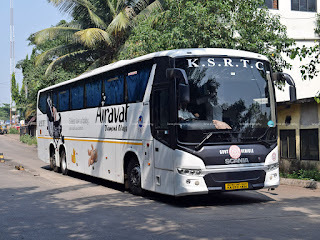 The ride quality of KSRTC Scanias are quite poor - the suspension is quite stiff and the body roll is on the higher side. Overall a good trip. Will I take this service again? Will surely consider if I need to travel again! 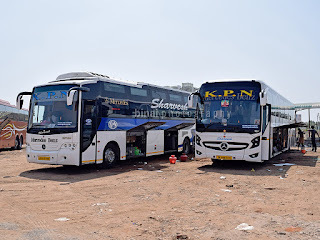 Hello Sir, Im a great fan of ur blog they r just amazing, actually because of ur blogs I hav created interest in travelling to parts of kerala by bus. I'm actually put up in Mumbai. I hav already booked my tickets to travel to kerala by bus. Hope to meet to Sir for sure.